Marcus Ratzenboeck is an accomplished violinist in both classical and rock music genres and has been an active and successful solo, chamber, orchestral, and studio performer for 20 years. After graduating from Florida State University with a Bachelors of Music in Violin performance, Marcus completed his Masters in Music at Indiana University. He was then appointed Principal Second Violin of the Louisville Orchestra and Adjunct Professor of Violin at the University of Louisville. Marcus was a member of the Louisville String Quartet often recording and touring. He was also Concertmaster of the Louisville Bach Society. 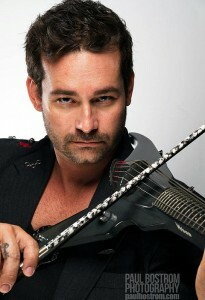 Currently Marcus is a member of the platinum selling rock band “Tantric” serving as a songwriter and the electric violinist of the group performing on 7-string “Vipers”. Tantric is a rigorously touring band with over 8 top ten active rock chart singles and four album released under Warner and Maverick Labels.